Pumpkinvine Corner, A Quilting Supply Retailer, shares a bit of history. My husband and I live about 45 miles north of Atlanta, Georgia in the foothills of the Appalachian Mountains. This part of the country is beautiful and I enjoy calling Georgia home. Not only is it full of natural beauty, it's also home to many quilters! I started quilitng in the early 90's. I have had the pleasure of meeting lots of other quilters since first picking up a needle. I belong to several guilds, bees and clubs all associated with quilting. I learned early that quilters seemed to have an over-whelming preference for all cotton fabric and Aurifil thread. Now quilters are more apt to think outside the box and try new things and different fabrics. However Aurifil thread has stood the test of time. What is it about Quilting? At one time or another I’ve enjoyed just about every art and craft imaginable. When my interest paled in one art, I moved on to the next. And then, in the early 90’s, I discovered quilting and felt I had come home. What I have discovered about quilting is that it can be anything you want it to be in terms of artistic expression. It has so many different facets, I can’t imagine ever getting bored with it. Each new quilt, whether big or small, funky or traditional, seems like a new adventure. I still dabble in some fiberless projects like altered books, card making, polymer clay, etc., but I’ve never felt the desire to move away from quilting. It will always be my favorite creative therapy. One big plus to quilting are the side trips it offers. Since a bed size quilt is so big and takes so long to accomplish, we quilters are always on the lookout for smaller projects that we can take on the road with us… to bee, the doctor's office or out of town. We sometimes need a dose of quick gratification and a project that can be finished quickly. The criteria we look for? It must include fiber. In the broadest sense, we quilters are basically fiber lovers. Bring it on if the project includes fiber. We embroider, use the punch needle, cross stitch, hook rugs, appliqué on wool, construct totes and purses, knit and crochet. Just let us touch fiber. But first and foremost, we are quilters. Maybe our genes carry the memory of our foremothers and we are driven to express ourselves with fabric. Maybe we are driven to keep our hands busy. Whatever the drive is, the satisfaction is great. Over 20 years ago my family moved to Georgia. We settled in a fairly rural area north of Atlanta on a street named Pumpkinvine Trail. The property backs up to Pumpkinvine Creek. While doing genealogy research, I found out that two of my great-great grandfathers, Cpl. James E. Musslewhite from Alabama and Pvt. William James Morgan from Texas, fought in this area during the Civil War. I researched the activities of their regiments during Sherman's march through Georgia and realized they had both camped and fought on Pumpkinvine Creek during the battles of New Hope Church and Pickett's Mill. I really felt an instant connection with these ancestors. Now, when I look at these woods around the creek, I visualize what it must have been like those many years ago. The travails suffered by all the soldiers, North and South, are etched in history and Pumpkinvine Creek remembers. It just seemed fitting that our name should include the word “Pumpkinvine”. 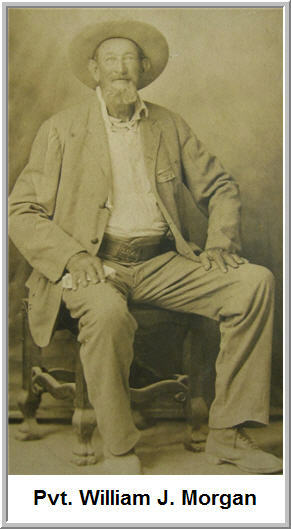 The picture above is of Private William James Morgan, my Great-Great-Grandfather from Texas..